Before Will Smith's I Am Legend, there was a classic science fiction movie made in 1971 that starred Charlton Heston as Dr. Robert Neville and like the 2008 movie I Am Legend, it was also based on the novel by Richard Matheson of the same name. With The Omega Man, the creators have taken some artistic liberty in changing the original novel by Matheson and even though certain parts have been changed, it's almost like a parallel universe "version" of the novel. In the movie, Dr. Robert Neville was hired by the US military to develop a biological weapon, however as fate would dictate, something goes awry and the world's population are turned into mutants. Roaming the streets alone for months, Neville believes him to be the last human alive until he stumbles upon "The Family", the last remnants of humanity. Unlike the villains in the modern remake of I Am Legend, those effected by Neveille's biological weapon have become albino-like mutants who despise modern life and technology which makes them a formidable opponent. Upon finding The Family, Neville vows to find a cure for humanity which will lead to the climatic ending of The Omega Man. The star of the movie is Charlton Heston who is the modern action hero archetype and parodies Harrison Ford in the film, although he was first. 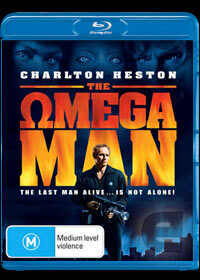 The movie is also oozing with 1970's references and stereotypes which at times makes this science fiction movie quite cheesy but there truly is something endearing about The Omega Man that would have scared several generations when first released, however now is quite tame but never the less an entertaining tale. There are at times quite controversial messages in The Omega Man such as the relationship between Heston and his female co-star Rosalind Cash that has a touch of black exploitation of the 1970's. The remastered video and audio quality of this presentation is outstanding and the image quality is truly very impressive. Presented in 1080p, for a movie that is over 38 years old is looking very good for its age and is easily one of the best transfers to Blu-ray for a movie that is quite old. The audio quality compliments the video quality, however unfortunately due to the age and the equipment of the time, don't expect any miracles. At the end of the day, this is a classic science fiction movie that is definitely one for fans of the original movie or for those classic science fiction buffs!